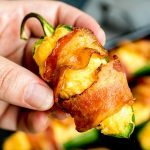 Delicious jalapeno poppers stuffed with buffalo chicken dip and wrapped in bacon. Place chicken breasts in boiling water for 15 minutes, or until cooked through. Using the dough hook attachment turn the mixer on medium for 1-2 minutes, or until chicken is completely shredded. Stir once or twice to make sure all of the chicken has been shredded. Add softened cream cheese to chicken and blend it together thoroughly. Add hot sauce and blend thoroughly. Add shredded cheese and ranch and blend thoroughly. Partially cook bacon, getting it partially crisp but still flexible enough to be wrapped around the poppers. Stuff the jalapeno halves with a heaping tablespoon of buffalo chicken dip (more or less as needed). Wrap each jalapeño popper in a piece of bacon. Arrange the stuffed poppers on a baking sheet.